If anyone attends, definitely send some pictures my way and I'll be happy to post them here! It seems Junko Mizuno has been busy, recently attending FICÓMIC (Salón Internacional del Cómic de Barcelona), which is a major and awesome manga/comics convention in Barcelona, Spain. She also visited the Mondo Bizarro gallery in Rome where she'll be presenting new paintings as well. Here are some nice photos of Junko signing and meeting fans at the Editions IMHO booth at FICCON. These photos all come via the IMHO Blog, fantastic French publishers of works by Suehiro Maruo, Tori Miki, Atsushi Kaneko, and many others we love. (Worth noting, Editions IMHO is opening a shop in Paris, and carry copies of Electric Ant #1!!). 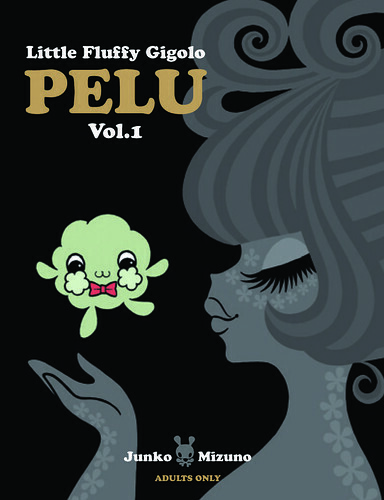 Since we're talking Junko Mizuno, it's worth noting again that her new manga, Little Fluffy Gigolo PELU Vol. 1, will be published by Last Gasp this fall. More details in this post. Oh, so wish I'd been there instead of here in New York. Would have loved to have seen/met her. I first came across her work in the sadly now long defunct Pulp Magazine and really loved it. Lucky you, people who were there. I couldn't make the show either, but hopefully we'll get some pics. I met Junko at San Diego Comic Con in 2004 (the same year that Hideshi Hino was in attendance). She was quiet but very nice and generous with her time. I haven't read her stuff in a few years (saw her in Pulp first too) but am actually quiet curious about the new book from Last Gasp.